The market is flooded with car scanners and the internet is flooded with reviews of those car scanners. It seems like for every available car scanner, there are dozens of reviews, each further complicating the task of settling on the right scanner for your needs. We’re going to be reviewing Innova’s 5160 Pro car scanner and focusing what you need to know in order to make an informed decision. The 5160 Pro ranks among Innova’s most impressive offerings and is arguably the finest product to come from the brand in all of its years in business. 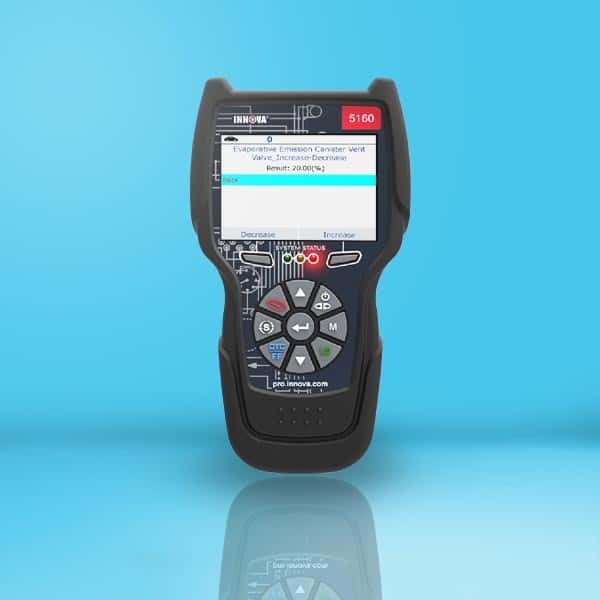 With the ability to stream live data over its 3.5-inch screen, the 5160 Pro can be used to detect and remedy issues with close to any car on the road today. Selling for more than $300, it will likely set you back more than you had budgeted for, but those who have dropped the cash Innova asks for this product have rarely reported regrets. As its name suggests, the Innova 5160 Pro is primarily intended for use by professionals, so you should pay careful attention to it if you work with cars for a living. Many of its features, such as live data streaming and its all-in-one screen design, are particularly advantageous to have in a professional workshop and cannot be found on most hobbyist car scanners. Non-professionals will be able to justify a purchase of the 5160 Pro if they deal with cars on a regular basis and want to fill their arsenal with professional-quality tools. More relaxed car owners, however, should take their search for a car scanner elsewhere. For less than $100, casual DIY mechanics will be able to find a car scanner intended for occasional use in less stressful environments. When you purchase the Innova 5160 Pro, you will receive the scanner packaged alongside branded Innova carrying pouches, an OBD2 connector lead, all necessary OBD1 connectors, and 3 AA batteries to power the device. Perhaps the most noteworthy feature of the Innova 5160 Pro is its 3.5-inch screen. This screen is much larger than that of the average car scanner and is advantageous as it allows the user to view multiple pieces of important information at a time without need for connecting the device to a laptop or tablet. This, of course, makes it easier to identify issues with the vehicle being worked on, making more speedy repairs possible. The 5160 Pro can be relied upon to read and eradicate ABS and SRS codes on 1996 and later OBD2 vehicles. It can also be used to determine the cause of “check engine” warnings on compatible cars. With the electronic parking brake reset, this scanner can even be used to adjust brake pads when repairs are necessary. Users will also appreciate the scanner’s steering angle reset. With an LED-lighted connector, the Innova 5160 Pro will help you locate your vehicle’s OBD port, regardless of the lighting conditions in which you are working. Should you experience any difficulties with your individual unit, you will have access to Innova’s team of certified technicians for dedicated customer service 6 days a week. If you’re a casual DIYer or a young mechanic lacking the capital to stock a garage with expensive equipment, the Innova 5160 Pro probably isn’t the car scanner for you. If you have the money to spare, however, this scanner is, at the very least, worthy of your consideration. Professionals with a steady stream of clients can purchase the Innova 5160 Pro safe in the knowledge that they will make their money back within a month and may even see an increase in their business owing, in no small part, to the scanner. Meanwhile, this scanner will allow dedicated hobbyists to complete a variety of tasks to a professional standard, no formal training required.